The mineral powder surface coating machine, widely used in the fields of non-metal stuffing or pigment like plastic, rubber, adhesive, macromolecule materials, high polymer composite, functional materials and dope industries, is an outcome of the development of new and high technology nowadays It can not only improve the compatibility of both non-organic mineral stuff and organic high polymer, enhance binding force of interfaces, rise the mechanical strength and comprehensive ability, but also increase the stuffing ability of powder, save product cost and add special physical and chemical property to the product to some extent. 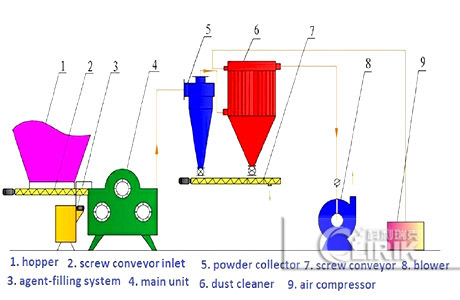 For resolving the above-mentioned problem in production, this high efficiency equipment SLG powder surface modifying machine is recommended by our company as a result of hard research work. The basic types are composite and coordination. The dosage is 0.1%-0.3% as stuff or pigment. 2,Silane coupling agent: It is a low molecule organic silicon compound with special structure, used for surface treatment of non-organic mineral stuff or pigment. 3,Organic chromium couple agent: The coupling effect is better in glass-fiber reinforced plastics. 4,Surfactant: a. Fatty acid and salt; b. Amine salt; c. Nonionic surfactant.